Courtesy of the Food Urchin. Advice on Twitter from Hollowlegs and Eatlikeagirl is to use the leaves and the flowers in pasta. I love the way the flowers are covered in garlic skin. I tasted some of the leaves and the flowers today and they were strong! Really garlicky! 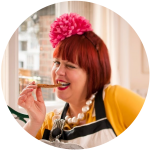 Next Saturday I’m doing a pizza night…straight from the Aga. I think I should use this wild garlic soon before it dies? This is an interesting blog post on wild garlic, how to grow it, cut it, cook it. We get masses of wild garlic growing round here. I made a whole batch of pesto with it last week, using wild garlic leaves in place of the usual basil. Makes a nice change on pasta! Gosh, I’d love to try using it but where and how do I find it?! Just last night, I went off to review the Wheatsheaf in Combe Hay, nr Bath (fabulous – really, properly fabulous). Anyway, Mike’s lamb arrived sprinkled with what I thought were merely flowers. I snarfled a whole mini-bouquet in a really trashy “hey look, I eat flowers!” way…only to realise a nano-second later that I’d successfully exiled myself from polite company for a week. It was worth it, though! And I learnt an invaluable lesson: pay more attention to how the dish is described on the menu! Curious Cat: tons of the stuff grows wild around Bath. I am now a convert, and will be harvesting like crazy from now until the end of the season. Went to Konstam last night and my main was served with wilted wild garlic leaves, absolutely delicious! Love me some garlic! Those photos are gorgeous, I’m so ignorant, I didn’t know they could be that beautiful. I made a ton of wild garlic “pesto” a few weeks ago and am still enjoying it now. In fact it’s not really pesto, just wild garlic and oil.